Obituary for Martha D. Woodin | Williams-Pedersen Funeral Home, Inc.
Martha D. (Doucette) Woodin. 74, of Whitinsville and a former longtime Upton resident, passed away peacefully on Friday evening, July 20, 2018, in her home surrounded by generations of loving family after a brief but courageous battle with cancer. She was the wife of the late Robert L. Woodin who passed away in 1989. Mrs. Woodin was born in Boston in 1943, a daughter of the late James and Eva (Karacozian) Doucette of Framingham. She was a graduate of Framingham High School, Class of 1961. 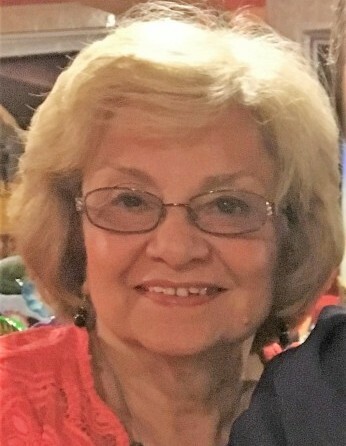 She was the co-owner of the former A&A Appliance Inc. in Milford for 22 years before becoming the director of the Millhaus Apartments in Upton. She then became the Executive Director of the Grafton Housing Authority prior to retirement. Marty enjoyed late nights at the casino and traveling with friends. Most of all, Marty enjoyed spending quality time with her friends and family. Marty, affectionately known as “Mema” to many, is survived by her three children, Kristen Konieczny of Upton, and her husband Tom, Bobby Woodin of Whitinsville, and his girlfriend Patty Bahosh, and Judy Field McGloin of Marshfield, and her husband John and her three daughters; her beloved grandchildren, Jamie Drew and his wife Dani, of Sumas, WA, along with Kevin and Kelli Konieczny of Upton; her great-granddaughter, Makenzie Drew of Sumas, WA; her brother, James Doucette and his significant other Mary Ellen Lakin, of Newton; and her sister, Dianne Herndon and her husband Rob, of Clovis, CA. She also leaves behind her nieces, Danielle Casey and Amy MacGregor; her nephew, James Herndon; her great-nieces, Hannah Casey and Sophia MacGregor; and her great-nephew Christian House. Marty’s abundance of friends filled her life with joy, and for this her family is beyond thankful. Her funeral Mass will be held at 10 AM on Thursday, July 26, in St. Gabriel the Archangel Church, 151 Mendon Street, Upton. Burial will follow in Lakeview Cemetery. Calling hours will be held on Wednesday, July 25, from 5 to 8 PM, in the Williams-Pedersen Funeral Home, Inc., 45 Main Street, Upton. In lieu of flowers, donations may be made to the Dana-Farber Cancer Institute in memory of Martha D. Woodin, to support cancer research and patient care at Dana-Farber Cancer Institute, P.O. Box 849168, Boston, MA 02284 or via www.jimmyfund.org/gift.